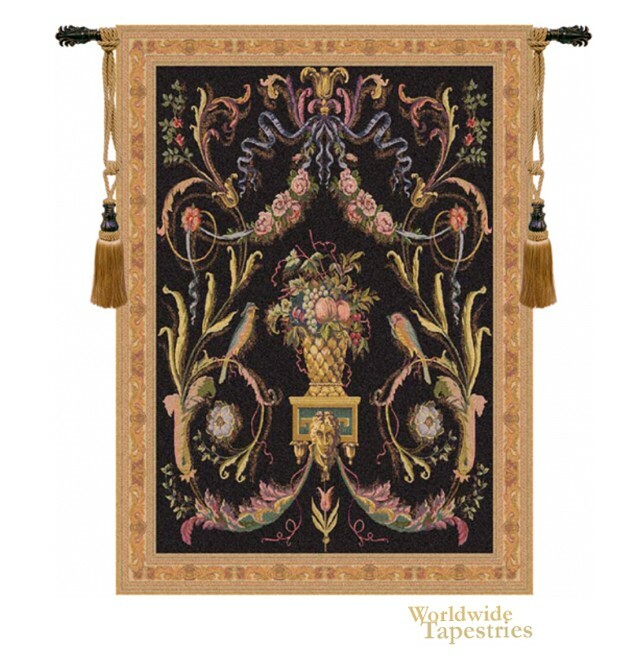 In this Birds (Black) tapestry we see a design inspired by an old Russian painting on wood. With a central floral motif, the design is surrounded by a variety of other foliage and flower elements. The green, gold, and mauve floral motif below shows a wonderful combination of color and design to create a feeling of luxury. Even the ribbonlike and leaf elements near the top combine colors beautifully which shows the wonderful design in the original. This Birds (Black) tapestry is backed with lining and tunnel for easy hanging. Note: tapestry rod and accessories, where pictured, are not included in the price. Dimensions: W 22" x H 32"
Dimensions: W 46" x H 62"